RIO DE JANEIRO -- A half-million foreign tourists, dozens of heads of state and the attention of the world's media. If there were ever a headache for anti-terror forces, it's the Olympics. 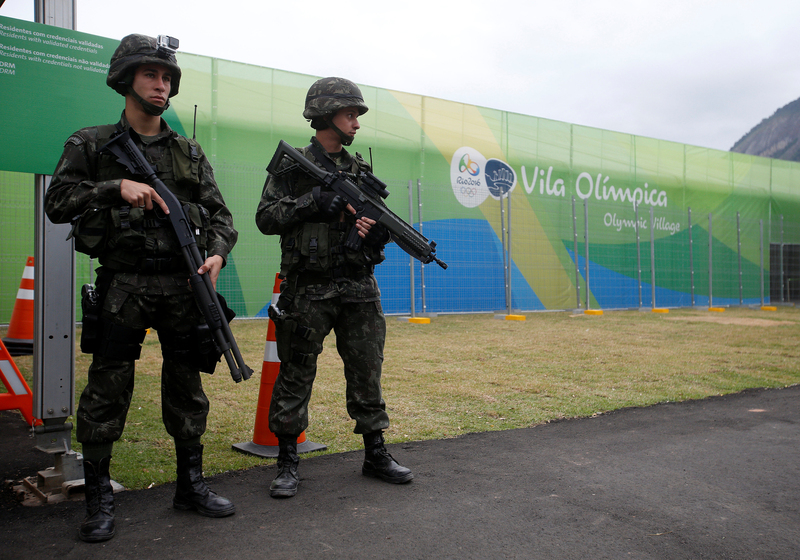 In the aftermath of deadly attacks by the Islamic State of Iraq and Syria (ISIS) in France and elsewhere, Brazil, which has almost no experience combatting terrorism, is beefing up security for the games that start in Rio de Janeiro on Aug. 5. Plans include doubling the number of security forces on the streets, erecting more checkpoints and working closer with foreign intelligence agencies than Brazilians did in the 2014 World Cup. Richard Ford, a retired FBI anti-terror expert who lives in Brazil, said that while the government has a robust program to keep athletes and venues safe, he worries that authorities aren't taking the threat of a lone-wolf or suicide attack seriously enough. He cited comments by Justice Minister Alexandre de Moraes, who surprised many last week by saying the chances of a terror attack at the games were "next to zero" and that the bigger concern is street crime. Just a day later, the federal police overseen by Moraes arrested 10 Brazilians allegedly belonging to an amateur cell that had professed allegiance to ISIS over the internet. "It's very naive to think that the risks for terrorism are minimal," said Ford, who has worked on security at several Olympic Games. "In the last year, the risk of a terrorist attack has gone up exponentially everywhere." Terror attacks have been rare, if horrifying at past Olympics. The most notorious was the 1972 massacre of 11 Israeli athletes and a police officer by a radical Palestinian group in Munich. A bomb planted by an anti-abortion protester killed one and injured 111 at the 1996 Games in Atlanta. "But Brazil has a lot of problems that other countries don't have," Ford said. "It's sort of a perfect storm for anyone wanting to carry out an attack." South America's first-ever games have been plagued by a long list of problems, from the Zika epidemic and severe water pollution to slow ticket sales and questions about the readiness of infrastructure built for the games. Compounding the security concerns is the deepest recession in decades, which has forced the cash-strapped Rio state government to slash spending and delay paychecks, and a distracting political crisis that led to the removal of President Dilma Rousseff while she faces an impeachment trial. To make up for the shortfall, the federal government has had to step in with almost $1 billion in emergency funding, much of which will be devoted to security. Extra police are also being deployed from other states. Many of Brazil's security holes are ancient and hard to resolve. Long, porous borders it shares with 10 countries are a major conduit for arms and drug smugglers. Obtaining an assault rifle, or explosives, is easy from the criminal gangs that dominate Rio's hillside slums. Last year, thieves even managed to steal a truck carrying a ton of dynamite. Harder to explain, though, is the late start on hiring security screeners. An investigation by The Wall Street Journal this month found that Brazil's government waited until July 1 to award the contract to recruit and deploy thousands of security guards at Olympic venues, raising questions about whether screening procedures were rigorous for people who will be tasked with monitoring x-ray machines and performing pat-downs. The security contract for the 2010 Winter Olympics in Vancouver was awarded 10 months in advance. To be sure, Brazil isn't a newcomer to hosting mega-events. Every year it welcomes millions of foreign visitors during the weeklong Carnival celebration, and the 2014 World Cup went off with no major incidents. But it has almost no experience fighting terrorism. The country has long prided itself on having an enemy-free foreign policy, one that rejects military intervention. Not surprisingly, many Brazilians are on edge as the military buildup at airports and elsewhere become more evident. There have also been several bomb scares. The ritzy beach neighborhood of Leblon shut down streets for several hours last week after discovery of a suspicious bag that turned out to contain only clothes. "I never felt like this about terrorism before. I only worried about street crime," said Fernanda Rocha, a pharmacist in Rio. "I have no idea how to avoid terrorists if they come." Despite Brazilians' easygoing attitude, better suited for a street party than an urban lockdown, Ford said there have been major improvements since the 2014 World Cup. Training exercises with U.S. and other foreign militaries to deal with chemical, biological and nuclear attacks have become more frequent. A joint-intelligence center has been created for the games, allowing intelligence services from around the world to share information and investigate threats as they emerge. Precisely because of Rio's reputation for criminality, elite police units are more battle-tested than their counterparts in major U.S. cities. "They're used to carrying bigger and stronger guns than we are," said Bobby Chacon, a retired FBI agent who makes his home in Rio and spent a year running security at the 2004 Games in Athens. There are expected to be 85,000 military personnel and police fanning out across the city, double the number on the streets in London in 2012. While most will be concentrated at sporting venues, tourist landmarks will also be heavily patrolled. "They have the police in place and trained to stop a large-scale, coordinated attack," Chacon said. "But there's plenty of opportunities to cause harm, and they shouldn't take anything for granted."